It’s August, and many schools are getting ready for the new school year. If you were using QuickSchools last year, you’ll want to know how to transfer your data over, so that you can make changes to the new academic year without affecting data from the previous academic year. And that’s very easy to do.The first thing you need to do (if you haven’t done so already), is to enable access to the set-up screens to the appropriate users. As the school administrator, click on “Features” and then on the link that says “Or click here to edit overall settings”. Finally add the appropriate users to the section called “New Semester Setup”. 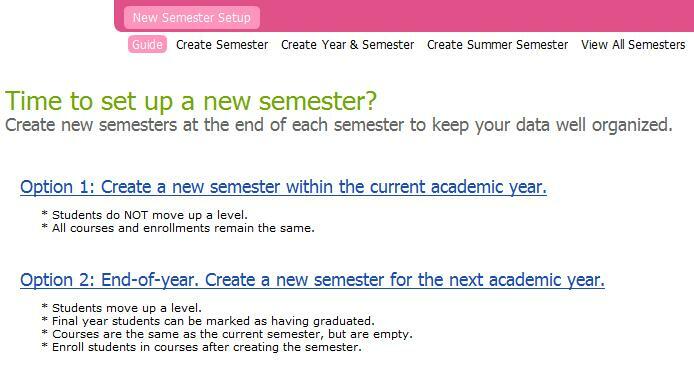 For users with the appropriate access, they’ll see a new menu called “New Semester Setup”. The first sub-menu called “Guide” will explain what you need to do to either create a new semester within the current school year, or to create a new school year altogether. The steps should be fairly straight-forward. Here are a few important things to note about setting up new Academic Terms. Each academic term works independently. When you change classes, subjects and enrolment, it only affects the current ACTIVE academic term. You can change the ACTIVE academic term by using the “View All Semester” screen. Again, changing the classes, subjects and enrolment affects only the current ACTIVE academic term. When you set up a new academic term, you are creating a copy of the old academic term, which can then be archived. You can then set the new academic term as the ACTIVE academic term and make changes without affecting the previous academic term. When setting up a new academic term, some elements are not “copied over”, and appear to reset. For example, the gradebooks and homework module will start out empty. We don’t recommend setting up all the academic terms up front for one main reason – to reduce data entry. If you set up all the academic term at the beginning of the year, and you discover that a student’s enrolment has changed in the first term, you will need to re-enter that change for all subsequent academic terms. But if you made the enrolment change first, and then created the new academic terms, that information will automatically be copied forward. So as soon as you know that you don’t need to change any student, subject or enrolment information, you can go ahead and create the new academic term. It’s a lot to digest in one go. Thankfully, schools only need to do this once every academic term. And our live chat agents are always happy to assist. Come chat with us if you have any questions.